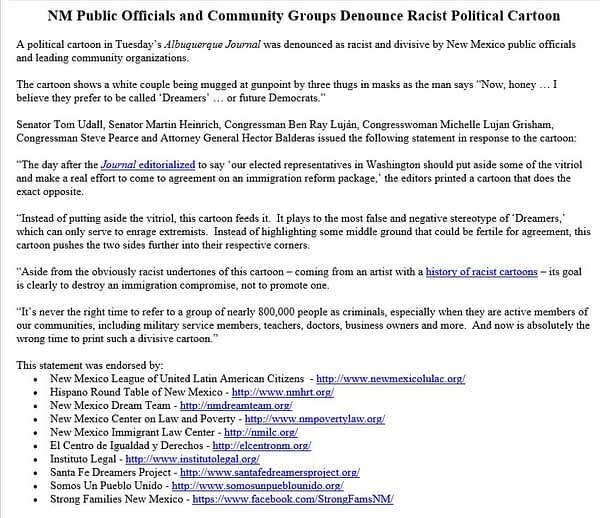 The Albuquerque Journal has apologised for running what it calls an “insanely racist” editorial cartoon by Sean Delonas earlier in the week. The cartoonist appears to have deleted his Facebook page as a result, though he remains active defending his work on Twitter. The cartoon showed an apparently frightened white couple being accosted at gunpoint by those identified as members of MS-13, an international criminal gang targeted by Donald Trump primarily from Central America. The accosted couple are trying to use “politically correct” language by stating the correct term for these muggers are “dreamers”, defined as undocumented minor migrants in the USA, and in the promotion of legislation that would that would first grant them conditional residency and, upon meeting further qualifications, permanent residency. The “future Democrats” other possibility indicated that Democrat politicians support such residency for their own future political success, as such people may be expected to vote Democrat when they are of age, and Sean has drawn cartoons about that as well – that the Journal didn’t publish. Editor Karen Moses issued a statement on Wednesday that said: “Our editorial pages offer views from all sides of the spectrum, and we realize some of the content will offend readers. The cartoon received criticism from US senator Martin Heinrich. While state senator Linda Lopez called it “another glaring example of the ignorance, racism and hatred openly permeating throughout our country since the election of Donald Trump” and that “ignorance and intolerance stifle the development of any healthy society and such attributes in the editorial cartoon are not in the welcoming spirit of true New Mexicans”. I stand 100% behind the cartoon. The cartoon, for the most part, is about use of the word “dreamers.” Politicians always give pleasing labels to bills that most Americans don’t want. I do not have a problem with legal immigration, only illegal immigration. Sure, many illegal immigrants are good people; and many of them take advantage of our social services and some are criminals such as MS-13. What bothers me the most is that it is becoming harder for people to voice their opinions in this country; if they offer an opinion that is unpopular (particularly with the left), attempts are made to shut down their voices by calling them racist, sexist, etc… At my age, I could care less what people call me. I do feel sorry for The Albuquerque Journal editor who published my cartoon. She looks like a nice person and I regret that she’s taking heat for my cartoon. We regularly get complaints from readers who are offended by our cartoons. Much of our email is from readers who demand that we should censor and apologize for the editorial cartoons that offend them. Usually these complaints come from the right, as most of our cartoons criticize President Trump. We don’t edit our cartoons for political point of view. We look to the spectrum of political debate to decide what is appropriate to syndicate and this cartoon is consistent with what we hear from the right end of the political spectrum. Sean Delonas, has drawn this cartoon in support of President Trump’s view that “illegal immigrants” bring violent crime to America; the cartoon responds to the president’s recent comments about the MS-13 gang. I’m not surprised that this cartoon sparks outrage. It is up to each newspaper editor to decide what is appropriate to run in their own newspaper. My personal view is that I agree with the critics of Sean’s cartoon. It wouldn’t be the first time that Sean Delonas has faced such controversy – and while social media has years of people objecting to his work… under Obama, it got so much so that Rupert Murdoch himself felt he had to apologise for the New York Post running one of his cartoons.